A testament to a bygone era of collecting, 1990 Score Football still holds a special relevance for many football collectors. 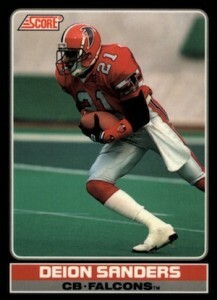 Issued in three different releases, most collectors associate the product with the Emmitt Smith rookie card found in the Rookie & Traded factory update set. However, the bulk of the release came in the first two series and these cards offer a colorful look back at the early part of the 1990s. 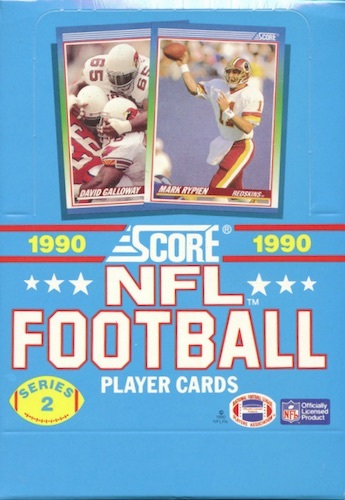 Perhaps to make up for the relative simplicity of the base design, 1990 Score Football includes a mix of colors on the card fronts. Like a box of crayons, it seemingly works and conflicts at the same time. The many lines and borders in the design can also be a bit distracting. 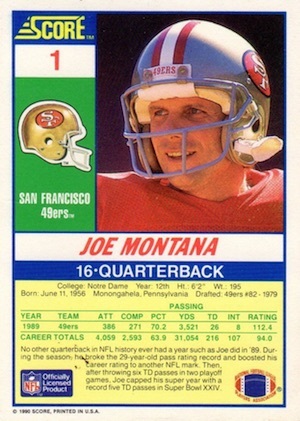 Card backs devote so much space to the team logo and close-up player image that only about a third is left for stats and a short blurb. The full base set checks in at 660 cards. 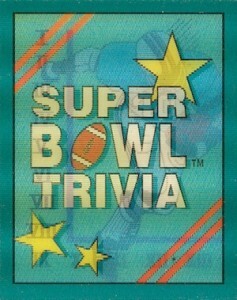 The release was split down the middle with Series 1 occupying #1-330 and the final 330 cards part of Series 2. 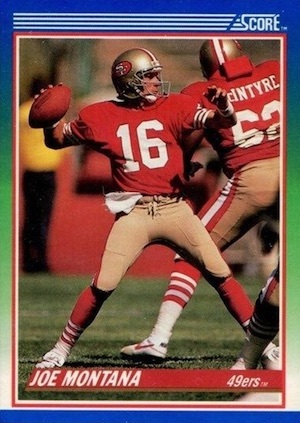 A third release titled Rookie & Traded, but normally known as 1990 Score Supplemental, adds another 110 cards through a factory set. Each of these cards has a T prefix. The key rookies from the set are all in the Hall of Fame and include Emmitt Smith, Junior Seau and Cortez Kennedy. 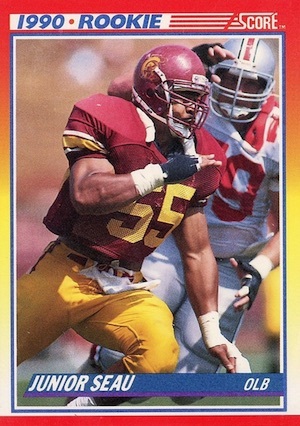 Smith's rookie card is available in the Supplemental factory set and Seau and Kennedy are both located in Series 1. 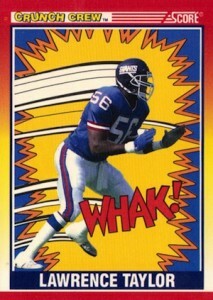 While rookie cards are a primary focus of 1990 Score Football, a large amount of subsets present collectors with some variety. The various options still incorporate the base design but include distinct backgrounds and easily stand out. The subsets include 1990 Draft, Hot Guns, Ground Force, Crunch Crew, Rocket Man, All Pro, Record Breaker, Hall of Famer, and The "Class" of 1990. 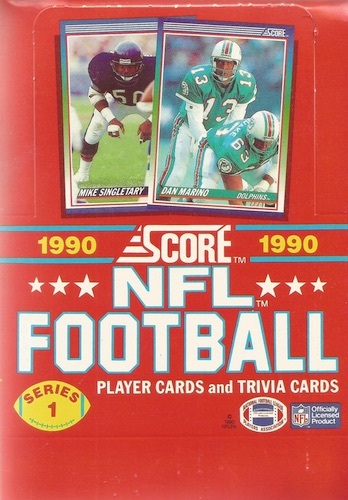 Additionally, 1990 Score Football includes several other card sets, but only one qualifies as a traditional insert. Dropping one per pack, the Magic Motion Trivia Cards feature 3D technology and include a Q&A session geared around the Super Bowl. The remaining card options for '90 Score are exclusive to certain sets or mail-in offers. 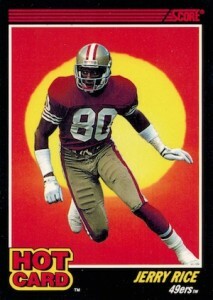 Hot Card inserts feature a sun background and are only found in 101-card Blister packs. 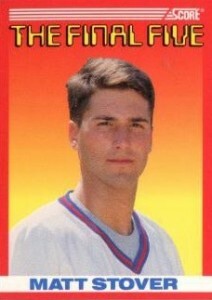 The Final Five covers the last five selections of the 1990 NFL Draft, including kicker Matt Stover. These orangish-red cards are only found in the 665-card factory collectors sets. 100 Hottest Stars was issued separately as a 100-card value pack. Although they are virtually identical to the base cards, the card numbering is different. Finally, Young Superstars were part of a direct offer from Score. The 40-card set stands out due to the black border. 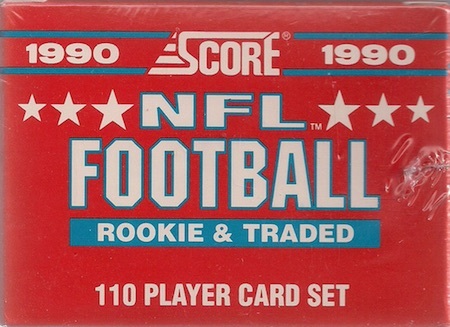 Due to high production, 1990 Score Football boxes are still readily available. Both Series 1 and Series 2 boxes can regularly be found for $5-10 per box. However, the key box for many collectors is the Supplemental set, which sells for a bit higher due to the Emmitt Smith rookie card. 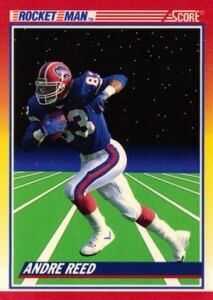 Subsets: HG = Hot Gun, GF = Ground Force, CC = Crunch Crew, RM = Rocket Man, AP = All Pro, RB = Record Breaker, HOF = Hall of Famer, 1990 = The "Class" of 1990. 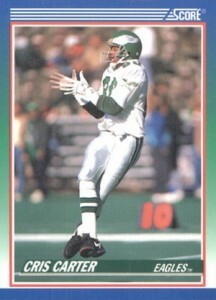 600 Buck Buchanan - "In the '83 AFL draft"
600 Buck Buchanan - "In the '63 AFL draft"
28 cards. 1 per pack. 10 cards. Exclusive to blister packs. 5 cards. Exclusive to factory set. 40 cards. Issued as set directly from Score through a mail-in offer. 110 cards. Issued as factory set. Shop for full sets on eBay. Here are the best deals on Supplemental Factory Sets currently listed on eBay. 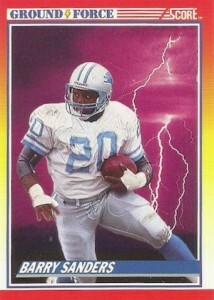 This set contains the Emmitt Smith rookie. It has a rather loud design compared to the ’89 set. Photos are pretty good and the cards were offered in two series. A bit of a letdown after the debut. 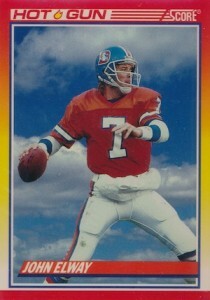 The main release was just plain ugly due to the rainbow of color used in the design of the cards. 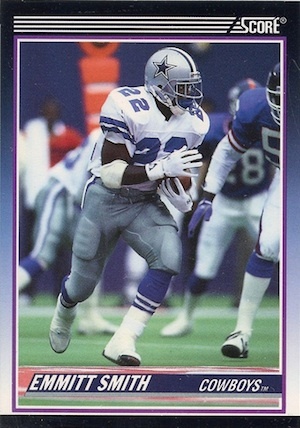 On the other hand the Supplemental set which contains the Emmitt Smith rookie had a much more subdued color palate which gave the cards a more refined classy look.